Soft white bread with hidden whole grain, no bits!. Source of fibre. Low in sugar. Low in fat. Suitable for vegetarians & vegans. Halal - HFA approved. Kosher - SKA.55% of your daily whole grain in 2 slices* *Based on US Dietary Guidelines of 48g whole grain a day. 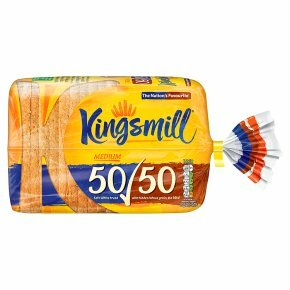 The nation's favourite1Kingsmill 50/50 has 61.6% of the Standard Wholegrain & White bread market. Source: Nielsen Scantrack. Total Coverage Unit Share, 52 w/e 8th October 2016. Kingsmill's bakers use flour from our own mills to bring you deliciously soft, great-tasting bakery every day. Our 50/50 loaf is soft white bread with hidden whole grain, no bits.